Cachet dark chocolate pear and almond bars are an exquisite union of their finest dark chocolate with notes of pear and crispy almond. The sweetness of the pear cuts through the flavour of cocoa, which is contrasted with the crunchy almonds. Combined, they create a symphony of flavours that will satisfy those looking for something more than simply chocolate. Made in Belgium, the chocolate is of the highest quality. 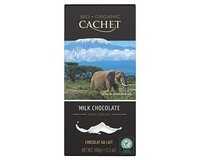 Cachet is a brand name of Kims Chocolates N.V, which was created in 1987 by Mr Fons Maex in the Belgian town of Tienen. Since its beginning, the company has developed rapidly and brought them to their position today as a leading Belgian chocolate maker and exporter. With over twenty years experience Cachet makes premium Belgian chocolate using artisan techniques, within state of the art facilities. Alongside classic types and flavours of chocolate, they are innovative in creating new flavour combinations to introduce to their range. It was not a coincidence that in 1993, Kims Chocolates N.V. was the first ever chocolate producer to become the recipient of an ISO 9002 certificate (which relates to the control of quality, production, installation and after sales service). Cachet consistently create high quality delicious Belgian chocolate for their customers. Ingredients: Cocoa mass, sugar, almonds 8%, pear granules 3.5% (inulin, pear powder 5%, natural flavouring), cocoa butter, anhydrous milk fat, emulsifier: soya lecithin. Cocoa solids 57% minimum. 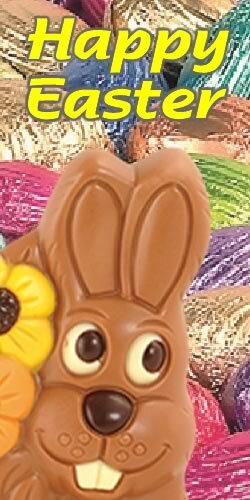 May contain traces of other nuts, gluten and eggs.